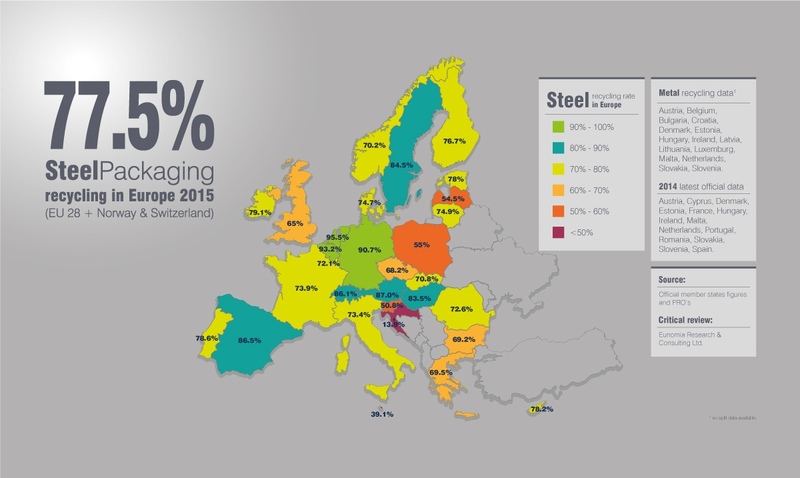 Recycling of steel packaging in Europe has reached another all-time high of 77.5%, according to figures issued by APEAL, the Association of European Producers of Steel for Packaging. This record rate, which represents data from 2015, confirms steel as Europe’s most recycled packaging material for the eleventh consecutive year and sees the recycling rate of steel packaging increase by 1,5 percentage points since 2014. The result is that over 2,7 million tonnes of steel have been effectively recycled and will be available for the manufacture of new steel products, a real example of the circular economy at work. Alexis Van Maercke, secretary general of APEAL, said: “This is another major achievement and sees the recycling rate of steel for packaging pull still further away from that of other packaging materials. “APEAL has long advocated ambitious yet achievable recycling rates for all materials in the circular economy package, on the understanding that we continue to measure the ‘real recycling’ rate. The methodology and data sources used by APEAL for the calculation of this rate were independently reviewed, audited and certified by energy and waste specialist consultancy, Eunomia. As well as being the most recycled packaging material in Europe, steel’s unique strength, formability and durability offer numerous benefits for the packaging of a wide variety of products. Steel delivers natural preservation, high performance protection and ultimately, greater food safety. Its portion-size versatility, long shelf-life and ambient storage qualities reduce food waste and energy consumption.